RuleML 2005 was the ?rst international conference on rules and rule markup languages for the Semantic Web, held in conjunction with the International Semantic Web C- ference (ISWC) at Galway, Ireland. With the success of the RuleML workshop series came the need for extended research and applications topics organized in a conference format. RuleML 2005 also accommodated the ?rst Workshop on OWL: Experiences and Directions. Rules are widely recognized to be a major part of the frontier of the Semantic Web, and critical to the early adoption and applications of knowledge-based techniques in- business, especially enterprise integration and B2B e-commerce. This includes kno- edge representation (KR) theory and algorithms; markup languages based on such KR; engines, translators, and other tools; relationships to standardization efforts; and, not least, applications. Interest and activity in the area of rules for the Semantic Web has grown rapidly over the last ?ve years. The RuleML 2005 Conference was aimed to be this year's premiere scienti?c conference on the topic. It continued in topic, leadership, and collaboration with the previous series of three highly successful annual inter- tional workshops (RuleML 2004, RuleML 2003 and RuleML 2002). 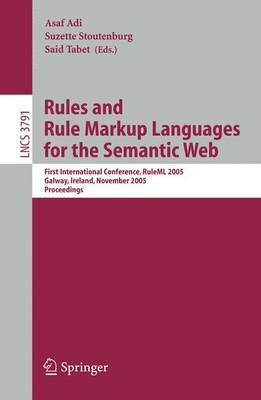 The theme for RuleML 2005 was rule languages for reactive and proactive rules, complex event p- cessing, and event-driven rules, to support the emergence of Semantic Web applications. Special highlights of the RuleML 2005 conference included the keynote address by Sir Tim Berners- Lee, Director of W3C.